have suffered serious depletion and degradation due to traditional practice of shifting cultivation, uncontrolled fire, unregulated fellings etc. Due to change in customary cultivation practices, focus has now shifted to raising horticultural crops… thus preventing secondary growth on old shifting cultivation patches. This has also led to the decline in forest cover assessed in the state. Thus, Mizoram’s forest cover may be taking a turn for the worse not because of shifting cultivation but because of the State’s push to establish permanent cultivation, notably horticulture crops such as oil palm. 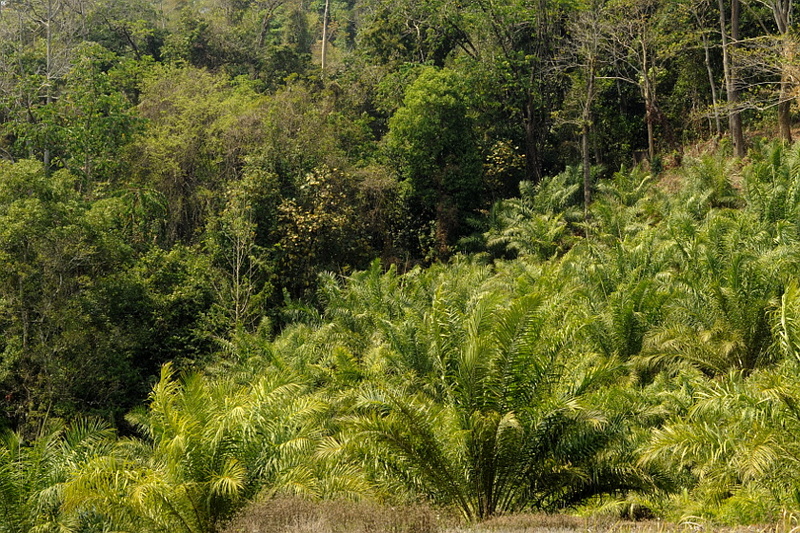 An oil palm plantation on a steep slope adjoining Dampa Tiger Reserve, Mizoram (Photo via Wikimedia Commons). Permanent plantations and settled agriculture also result in permanent loss of forest cover, unlike the temporary loss of forest cover followed by regeneration that is characteristic of shifting cultivation. Unfortunately, the FSI reports do not distinguish areas under plantations, nor do they carefully record patterns of regeneration, so on-ground change in land use and forest cover remains difficult to assess accurately. As a result, Mizoram’s remarkable organic farming system of shifting agriculture, locally called jhum or ‘lo’, remains much misunderstood and maligned. Tropical rainforests cleared for oil palm plantation in Sabah, Malaysian Borneo (Photo via Wikimedia Commons). The expansion and impacts of oil palm (Elaeis guineensis and E. oleifera) cultivation in tropical regions, especially in south-east Asian countries, is now a global problem from social, conservation, and climate change perspectives. Palm oil now accounts for a third of vegetable oil use worldwide. The area under oil palm cultivation is rapidly increasing from around 3.6 million hectares in 1961 to over 16.4 million hectares in 2011, much of it by cutting down mature, secondary, and peat swamp tropical forests. The deforestation and burning of forests in southeast Asia for oil palm is leading to species extinctions, water shortages, and widespread pollution, besides contributing to climate change. Forest areas have shrunk to fragments as oil palm plantations expand over vast areas in south-east Asian countries, like here in Sabah, Malaysian Borneo (Photo via Wikimedia Commons). In India, oil palm plantations are now being actively promoted by government and private companies, including in Mizoram where 101,000 hectares have been earmarked and over 17,500 hectares have already been permanently deforested for oil palm cultivation. 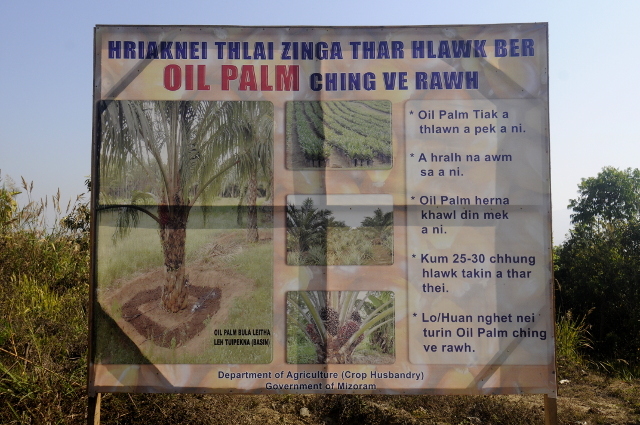 Near Aizawl’s Lengpui airport, a large hoarding now advertises the benefits of oil palm cultivation. But the photographs of irrigated oil palm trees on flat lands appear incongruous amid the surrounding steep slopes withering dry in the sun during summer. Oil palm promotional poster along the highway near Lengpui airport. Further ahead, in areas newly cleared of bamboo and forest cover, small oil palm plantations appear and bare slopes are studded with rubber saplings. Intended as permanent crops, these plantations are often touted as superior to shifting cultivation by government authorities and private companies. Forest cleared for establishment of monoculture rubber plantation in buffer zone of Dampa Tiger Reserve, Mizoram. In Mizoram, area under plantations of oil palm, rubber, and teak is increasing. Teak, a deciduous tree not naturally occurring in Mizoram, is planted extensively by the State Forest Department even in evergreen forest zones. All these plantations are worse than shifting cultivation from an ecological viewpoint. Shifting cultivation is preferable to industrial and monoculture plantations because it creates and maintains a dense mosaic of bamboo, secondary, and mature forests in the jhum landscape. In other parts of northeast India, diverse bamboo forests and jhum areas are being replaced by tea plantations, mining, and timber monocultures. Scientific research from rainforests of south-east Asia and the Western Ghats of India attests that industrial monocultures, such as teak, tea, oil palm, and rubber, provide habitat for fewer wildlife species than natural, mature, and secondary forests. A study from Thailand revealed that rubber and oil palm plantations have 60% fewer bird species than lowland rainforest. 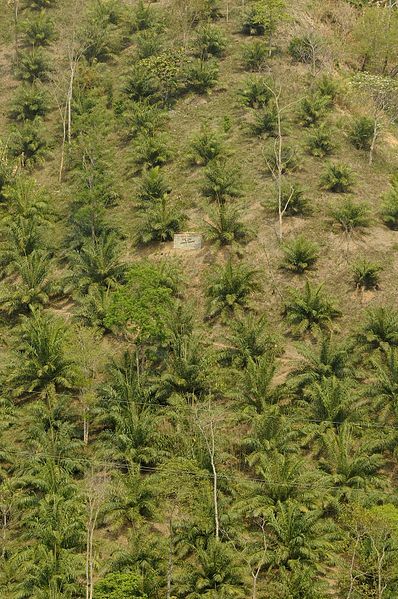 Oil palm is conventionally grown as monocultures after clear-felling forest, retaining little or no natural tree cover. Numerous studies have documented that oil palm plantations support very few rainforest plant and animal species. Oil palm plantations may shelter less than 15% of the forest biodiversity, besides reducing water availability and quality in hill streams. My own recent research from the Dampa landscape along with Jaydev Mandal, research scholar at Gauhati University, indicates that monoculture oil palm is much worse for wildlife than the jhum mosaic of regenerating forests and fallows in the landscape. Under multiple schemes besides the State’s flagship New Land Use Policy (NLUP), both Centre and State are subsidising seedlings, fertilizer, and building of water tanks, besides the construction of oil palm mills to benefit private companies. Furthermore, in an unusual arrangement, the State has apportioned captive districts to the three private companies (Godrej Oil Palm Limited, Ruchi Soya Industries Limited, and Food, Fats & Fertilizers Limited) for palm oil business, thereby making these farms “corporate plantations in effect” as one recent news report puts it. Converting secondary forests and shifting agriculture to oil palm is a travesty of watershed management. 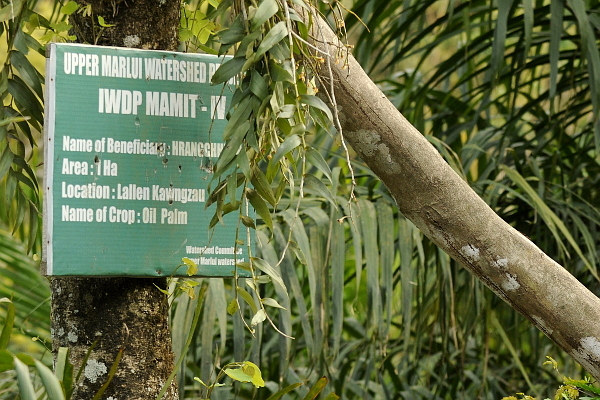 In Mamit District, oil palm is even planted after clearing forests on slopes and catchments under the Integrated Watershed Management Programme. Water is diverted from natural streams to tanks and taken through pipes to feed this water-demanding crop in newly-deforested areas, in a brazen travesty of the concept of watershed management. In contrast to such support and subsidies, the State Government provides no support for farmers practicing ‘lo’ shifting agriculture. 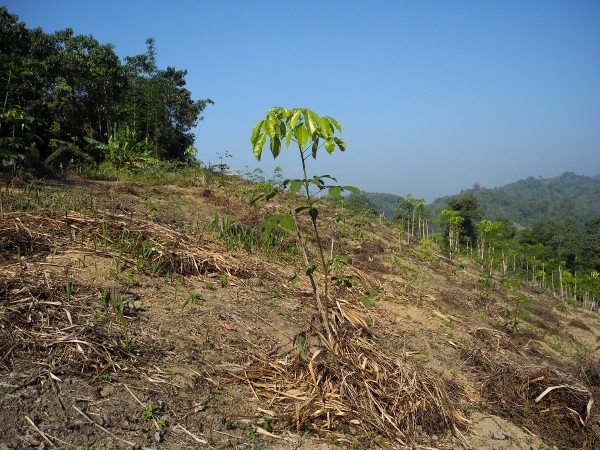 Shifting cultivation is often considered an unsustainable practice. In reality, the major challenges today for sustainable agriculture and agroecology actually concern industrial agriculture and plantations: how to reduce dependence on agrochemicals and move to organic farming, how to diversify from single to multiple crops, how to integrate fallows and hedgerows and unplanted areas in plantation landscapes, how to retain native plant species and vegetated buffers along rivers, ravines, and ridges. Oil palm promoters and planters have not made any effort to retain valuable bamboo forest patches, wet rice valley agriculture fields, strips of forest vegetation along streams and rivers to prevent erosion and pollution, or implement other essential safeguards. All these aspects of sustainable agriculture, missing in oil palm plantations, are often already practiced in shifting cultivation in Mizoram. 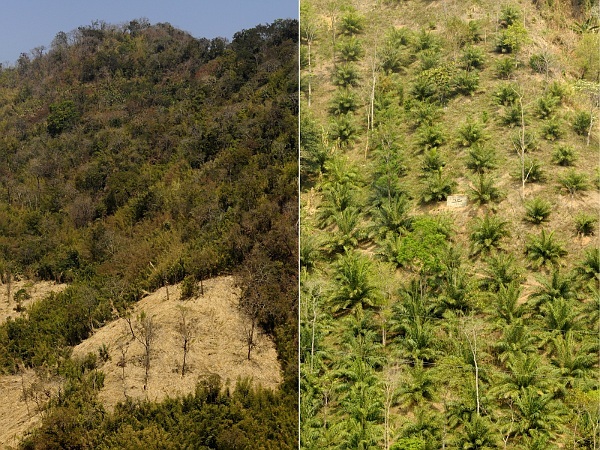 Better land use: The jhum landscape mosaic of fields, regenerating fallows, and forests (on left) is a better form of land use and forest cover than monoculture oil palm plantations (on right). … in contrast to many policy-makers, shifting cultivation is now considered a highly ecologically and economically efficient agricultural practice provided that [authors’ emphasis] the fallow period is sufficiently long. The authors list options to enhance shifting cultivation, such as nutrient and water supplementation, optimising crop choice to extend site use period along with measures to further retain soil and fertility, and judicious use of commercial fertilizer coupled with organic inputs. Jhum farming, with or without refinements, and modified multi-cropping systems such as the Changkham model and Sloping Agricultural Land Technology (SALT) are all preferable to monoculture plantations such as oil palm. 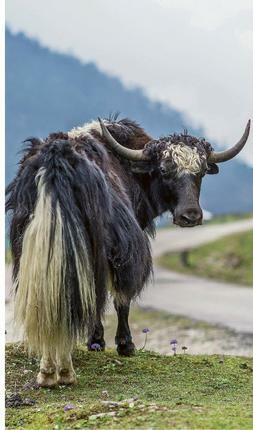 Trying to wean farmers away from jhum and remove land forever from the ambit of shifting cultivation by usurping spaces for permanent plantations will have significant repercussions for ecology and economy. As oil palm and rubber plantations begin to replace bamboo and jhum and permanently dot and scar the slopes of Mizoram, an economy based on culture, diversity, and community is changing to one based on cash, permanent monocrops, and private interests. Instead of promoting such a transition in Mizoram—a land of steep slopes, fragile ecology, water scarcities, and remote villages—a policy more sensitive to land and the needs of farmers who practice ‘lo’ shifting agriculture is urgently needed. This article appeared on 20 August 2014 in Newslink, a daily published from Aizawl, Mizoram [Original PDF here]. It is cross-posted on View from Elephant Hills. Hindu In School	Meat momos for everyone!